Throughout the year I attend various exhibitions, rodeos and market venues. The notable times and places, I advise on my Facebook page. Most of my work is done by commission and I am always available to speak with you about your ideas for pieces and designs for artwork. If it can be done in Leather….I’ll do it! If you wish to see samples of my work and live in the Brisbane area, my most permanent display is in the Samford Valley Arts and Crafts Centre…”The Slab Hut”. 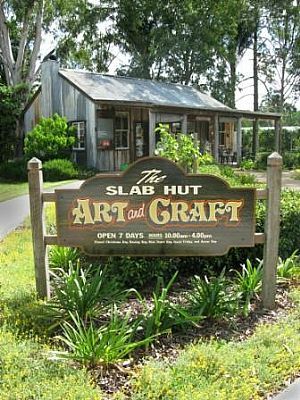 The Slab Hut is a unique art and craft venue located in the picturesque Samford Village, just north of Brisbane, Queensland, Australia in picturesque South East Queensland. This distinctive reproduction of a traditional slab hut is the home of the non-profit Samford Art and Craft Association Inc. The Slab Hut sits in a garden setting and features local timbers and recycled corrugated iron.You will see a wide range of exciting & individual works of art and craft which reflect the diversity of the members, who are there to offer a personalized service.